Elegant doesn't have to be over the top. The Simply Black tie table cards are the perfect combination of simplicity and luxurious, making them ideal for a wide range of wedding themes and color schemes. The design features an ornate script font combined with a simple swirl emblem and your personalized message. Combine with one of our many wedding invitations and save the dates to create your own wedding stationary ensemble. 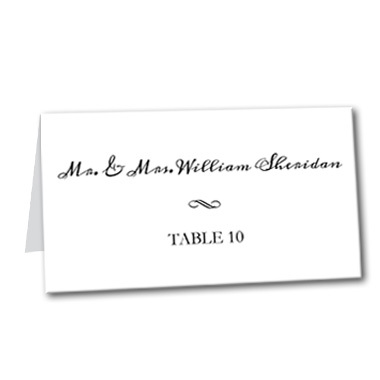 Simply Black Tie Table Card For the best experience, we recommend personalizing your stationery on a desktop computer.